Do Companies Make the Most of Their Employer Brands? Branding goes beyond messaging and includes a company’s products and services as well. The same goes for employer branding. Can Yelp employees rate their jobs on Yelp? 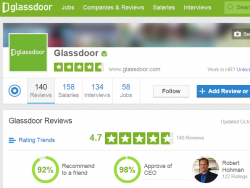 Do Glassdoor Employees rate their experiences on Glassdoor? Can you drop your resumé into a Dropbox to apply for their jobs? Can You Apply for a Job at Twitter With a Tweet? Twitter does have an account just for recruiting: @JoinTheFlock — with 407,000 followers, about the same as Mountain Dew. The account does a good job of showing employee events and conveying the company’s fun culture, with plenty of hashtags like #LoveWhereYouWork. However, I found it interesting that the application form on the Twitter careers site doesn’t ask for the candidate’s Twitter handle. While there are examples of people getting jobs through a single tweet, those jobs weren’t at Twitter. The same goes for Twitter’s subsidiary, Vine. We all remember Dawn Siff, whose six-second video resumé got her a job — but not at Vine. Twitter may be missing out at recruiting its biggest fans. Twitter social recruiting: Twitter doesn’t recruit on Facebook. Aside from its satirical video “The Future is You!,” it doesn’t recruit on YouTube. Twitter isn’t on Instagram. The company has three recruiting-related boards on Pinterest, including one called “Culture.” Twitter does have a careers page on LinkedIn featuring a very nice video … created by Glassdoor. 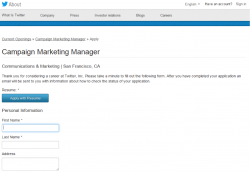 Can You Apply for a Job at Facebook With a Facebook Post? Facebook does have a Facebook presence for recruiting but it isn’t designed like a Facebook page; clicking on “Careers” takes you to a robust site, and the application screen helpfully pulls some information (like college degree) from your Facebook profile, but the site asks for a LinkedIn link. Facebook’s page on Facebook (got that?) celebrates the brand but doesn’t seem to announce job openings. Facebook social recruiting: Facebook doesn’t recruit on Twitter; @FacebookJobs belongs to an unrelated third party. Facebook has recruiting videos on YouTube, but no dedicated channel. Facebook isn’t on Pinterest at all, but has some fun employee photos on Instagram. Can You Apply for a Job at YouTube With a Video? The answer is no. While YouTube does integrate nicely with Google Plus to populate parts of the online application, the form doesn’t ask for a YouTube account, video links, or any video version of a resumé. 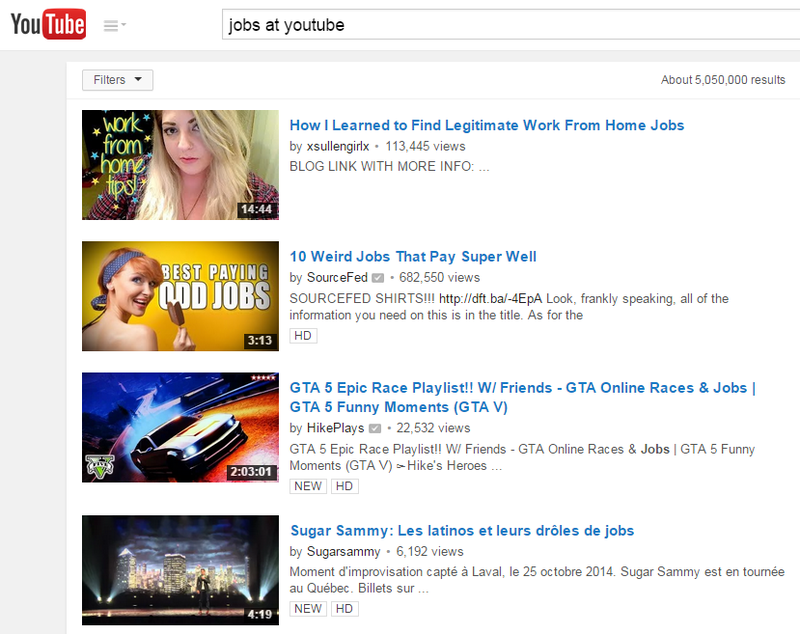 While there are examples of people getting jobs through video cover letters, YouTube itself doesn’t seem to want them. In addition, I would have expected YouTube’s recruiting to include a lot of videos about culture, tours of the offices, interviews with employees. So I was surprised to see the “Life at YouTube” section of the company’s careers site has just one video — and it’s actually a collection of “defining moments” of 2013 starring employees, as opposed to employees talking about their jobs. On the careers pages where job-seekers are supposed to “learn about teams and roles,” there’s not one single video. On YouTube’s main, public-facing site, searching for “YouTube careers” or “Jobs at YouTube” doesn’t bring up any content from the company. YouTube social recruiting: YouTube does have a recruiting presence on Twitter, but it’s through the mothership: @GoogleJobs. The same goes for Facebook, where YouTube jobs are folded into Google. The YouTube page on Facebook doesn’t include links to any recruiting resources. YouTube does list jobs on LinkedIn but, once again, doesn’t provide any videos. 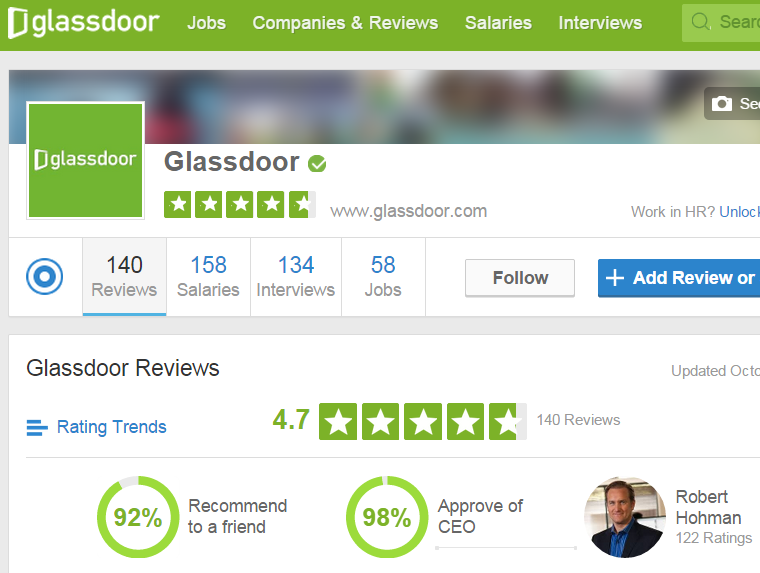 How Do Glassdoor Employees Rate Their Jobs on Glassdoor? I also wondered about Dropbox’s employer branding in its recruiting process. Sure enough, when you start an application, the button for resumé says “Choose from Dropbox” and opens your Dropbox folders. 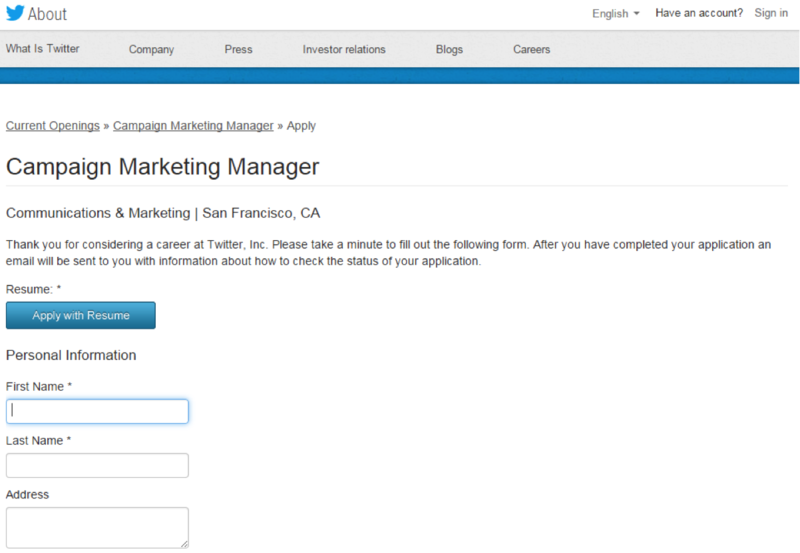 Similarly, when you apply for a job at LinkedIn, a window pops up asking to fill in your application with information from your LinkedIn profile. How on-brand is your recruiting? Does your employer branding reflect your organization’s culture, mission, and values? Are you letting your biggest fans and most loyal customers learn about joining your company in the most effective way?